Is anyone planning a blogger meetup? If not, then let’s plan one! Things are moving forward in the baby hat translation publication. I’ll definitely point you in the right direction as soon as that happens. The knitting of the actual hat has been disastrous. I’m on try three, but I think I’ve got it figured out now. Yes! That! Jenna and I are definitely going and I’m working on convincing some other Western Mass bloggers to come. 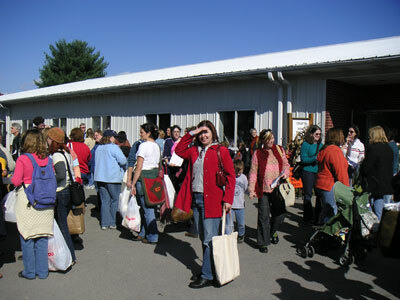 I was just at New Hampshire this weekend, and will be at the Maine Fiber Frolic in June. Is anyone planning on going to the frolic? I’m going — looking forward to it. Haha! I’m gonna get you! Can I just send my paycheck? I see about 10 vendors I would like to go and visit! I’ll be there on Saturday. I’d love to attend a blogger meetup! I’ll be there on Saturday and would love to attend a meet-up. Hey, Macoco clued me in that you were asking about/planning a blogger meet-up at MA sheep & wool. I organized one last year, just posted on my blog a few days ago to get suggestions on place & time. Let me know & we can all publicize it!